After an initial period of wariness, businesses and individuals are quickly warming up to the idea of cloud computing, and convenience is a key element in bringing them around. Nowhere is the convenience factor more obvious than in the cloud storage space. Placing data in the cloud makes it available from anywhere, anytime. In weighing the benefits of cloud storage, though, a top consideration is the cost – both those intangible costs such as loss of complete control and the literal monetary cost. When organizations have accumulated huge amounts of data, putting it into the cloud can be expensive, but cloud providers are making it more and more affordable with frequent price drops as they compete with one another for your business. Amazon has been steadily reducing the pricing for all of its Amazon Web Services (AWS) cloud services since 2008. Around this time last year, the company announced a huge price cut for a number of its core services, including the S3 storage service, in response to new, lower prices that had been announced by Google a week before. At that time (March 2014) S3 prices were cut to 3 cents per gigabyte for the standard storage. This was a huge drop that provided customers with savings up to 65 percent. Apparently the company has spring fever once again, as almost exactly a year later Amazon has jumped out in front in the race to the bottom, price-wise, in the more consumer-oriented cloud storage space to compete with popular services from Microsoft, Dropbox and Box. This time the promise is unlimited storage at low prices: $60 per year (which translates to only five dollars per month, little more than the price of a Venti White Chocolate Mocha at Starbucks) to store all file types. If you only want to store photos, it’s even better: just $12 per year (one dollar per month). The photo plan also allows you to store up to five gigabytes of other file types. This move is obviously aimed at enticing customers away from Microsoft’s OneDrive, Google Drive and the “boxes.” So how does it compare to those other services? It can be difficult to sort through all the different options and get a fair comparison. Also, please keep in mind that in this competitive environment, pricing, plans and storage capacities are changing all the time, so there could well be new price cuts (or perhaps increases) between the time this is written and when you read it. Let’s look at what each of the cloud storage services is offering at this moment. First, let’s look at Dropbox. There are quite a few plans to choose from. At the time of this writing, the basic plan is targeted at consumers. It’s free, but gives you a mere 2 gigabytes of storage space, although you can “earn” additional space by referring others to Dropbox. Dropbox Pro, which is touted as a place to keep both your personal and work files (we won’t go into the security implications of such co-mingling) costs $9.99 per month on a month-to-month basis, or if you pay for a full year, the price is discounted to $99. For that, you get 1 terabyte of storage space as well as the ability to remotely wipe data. Dropbox for Business carries a flat rate of $15 per user per month for “as much space as you need” or again, you can pay annually at a discounted rate of $150 per user (which comes to $12.50 per month). Their web site includes the caveat that “teams start off with 1 terabyte of space per user. If you need more, just let us know.” There are discounts for non-profit organizations and educational institutions. The basic package for business includes 5 users. Microsoft’s OneDrive currently offers 15 GB of storage free, but 100 GB will set you back $1.99 per month ($23.88 per year) and 200 GB costing $3.99 per month ($47.88 per year). Thus for only $12 and change per year, you go from a limit of 200 GB to unlimited with Amazon. What about OneDrive storage for Office 365 users? That’s where it gets confusing. Way back in October 2014 (five months ago at the time of this writing), the Office.com blog reported that Microsoft was increasing the storage limit from 1 terabyte per user to unlimited. 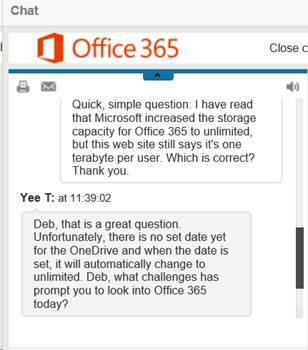 However, the Office365 web site currently shows the storage limit to still be 1 terabyte. In an effort to clarify this, I engaged the online chat feature on the web site and asked if this was the case. The answer I was given (by “Yee T”) was that “There is no set date” for the change, as shown in the screenshot below. To confuse matters further, there were reports in November that the unlimited storage was in fact being rolled out – to those who had signed up on a waiting list. At this point, it’s not at all clear whether someone who signs up for a new account at this time would have the 1 terabyte limit or the unlimited storage (which, according to the article linked above, is actually limited to 10 terabytes with the ability to request more, similarly to the Dropbox for Business plan). GoogleDrive, in keeping with its head-to-head competition with Microsoft, also offers a free 15 GB of storage space and 100 GB for $1.99 per month. For a terabyte, you have to pay $9.99 per month, whereas Microsoft gives you a terabyte and locally installed Office applications – Word, Excel, PowerPoint, OneNote, Outlook, Publisher, and Access – for only $6.99 per month with the Office 365 “personal plan” service. GoogleDrive does offer more options for larger amounts of storage: 10 TB for $99.99/month, 20 TB for $199.99 per month and 30 TB for $299.99/month. Note that your Gmail and any photos you have stored in Google+ also count toward your storage space allocation. GoogleDrive for Work includes unlimited storage for $10 per month, per user ($120 per year). Based on the pricing at this time, Amazon has clearly taken the lead with its new unlimited option. If price is your only criteria, you can save a great deal of money by going with Amazon. In selecting the best storage option for a particular individual or company, of course, there are additional considerations. If you use Microsoft Office, the Office applications (and the modern Windows operating systems) integrate with OneDrive to a greater extent than the third party storage services. If you use Google Apps, they are integrated with GoogleDrive. Dropbox doesn’t have some of the limitations on number of files that some of the other services do. Speaking of limitations, it pays to check out beforehand what those are and evaluate the services in terms of how you actually use the storage space. For example, as Tony Bradley discovered last November when Microsoft announced their unlimited storage for OneDrive, “unlimited” might not mean what you think it does. He wrote about it in an article for TechRepublic titled The limits of unlimited OneDrive storage. Even if a provider gives you “unlimited” total capacity, be sure to find out whether there are limits on file size and number of files. OneDrive’s 20,000 file limit could be reached pretty quickly if you want to store a lot of photos or other files, even if they’re small in size. The good news is that the cloud services allow you to try them out for a free trial period, so you can make a hands-on comparison before you commit to one. The bad news is that just because the one you pick is the least expensive or most feature-filled today doesn’t mean one of the other services won’t leap ahead of it next week or next month or next year. Moving all of your data to a new service is certainly doable, but it can be a long and painful process. Nonetheless, it’s good to have options and there is no doubt that the fierce competition in this space has been good for customers. 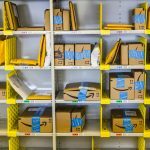 Amazon has taken prices to a new low with their latest reductions, and it almost seems as if we’re headed toward a day when we’ll be able to store vast amounts of data in the cloud at no cost at all. Even if that day never arrives, it’s hard to resist the low cost of cloud-based data storage today in comparison to maintaining your own file servers.